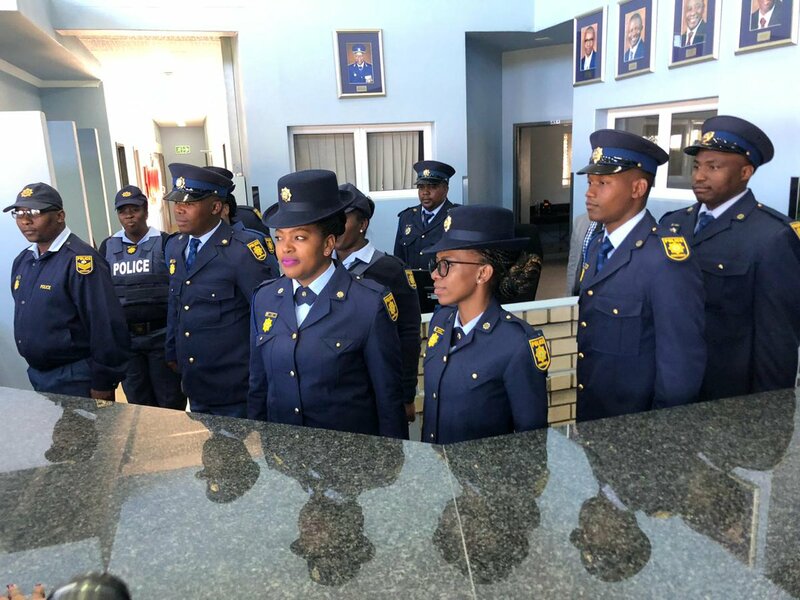 Mt Fletcher - Police Minister, Bheki Cele, on Tuesday officially opened the new state-of-the-art Pholile police station worth R50 million at Police village, located halfway between Matatiele and Mt Fletcher in the Eastern Cape. This long-awaited police station came after various pleas from the local community, who were fed up with rampant crime, especially cross-border crime like stock theft and illegal migration. Minister Cele was accompanied by Divisional Commissioner: Policing, Lt Gen Masemola, DNC-Crime Detection Lt Gen Tsumane, Limpopo Provincial Commissioner-Lt Gen Ledwaba a North West Provincial Commissioner-Lt Gen Motswenyane and MEC-Transport, Safety and Liaison. The new station was provided with six vehicles - two police vans, a Quantum and three bakkies, that will be utilized by Detectives and the Crime Prevention Unit. Several junior police members have volunteered to come and serve this community while efforts are underway to recruit more locals to be part of the personnel at this police station. Addressing the community, Minister Cele said, "I am told this is a gateway police station going to the Lesotho border. This is a beginning of how things should be done. We will work hard to increase members to have a good mix of locally-based members and those coming from far away." He said it is not true that government caters for urban areas only and opening of Pholile Saps is testimony to that. "In 14 days, we will be sending Supply Chain Management people to come and sort matters relating to your accommodation around here," Cele said. "We also want to make the station as a center of development. As you can see, most police are young and also need entertainment, we will look into that and provide an alternative." He requested the traditional authorities take care of the police officers deployed at this station while he spoke harshly about police, who allow the community to corrupt them. Cele also thanked the community, who donated horses to assist in the fight against cross-border stock theft. The day was also used to award 30-year-service medals to police officers. The medal recipients are from the surrounding areas - Mt Ayliff, Mt Fletcher, Matatiele, Maluti, Katkop, Elands Height and Avondale. Eastern Cape SAPS Provincial Commissioner-Lt Gen Ntshinga was elated at the opening of the Pholile police station. "Today, is my duty is to thank all the political principals, especially MEC [Weziwe] Tikana as well as local government," she said. "We, as the SAPS, are indebted to the support we got from the local mayor. To all government departments, we are thankful as opening a police station of this size is no child's play." She also highlighted the amazing role played by the provincial CPF. "As the leadership of the province we thank you from the bottom of our hearts," said Lt Gen Ntshinga. She also used this opportunity to share the province 's readiness to assist in the upcoming Easter holiday and upcoming national elections.